September 17th; October 15th; November 19th; December 17th; February 18th; March 18th; April 15th, and May 20th (Annual Luncheon Meeting at Windrows: Menu and Reservation Form ). Robert Ashbaugh, former Deputy Director of the Department of Justice, will present notes on “Intelligence Analysis and War Preparations in 1941.” We will learn how our government operated prior to one of the most seminal events in American History. He will discuss insights into the US new technological marvels, radar, the electronic detector, and MAGIC, the decoded intercepts of Japanese diplomatic communications, and how the government failed, sometimes with plausible explanations, sometimes not. Join us for this fascinating in depth analysis of an infamous day in our country’s history. We will meet on Monday, April 15th at 1 p.m. at All Saints Episcopal Church on All Saints Road in Princeton. Guests are encouraged to attend. For more detailed information on upcoming events, refer to the Monthly Newsletter or Press Releases under News. Thomas J. Espenshade, Professor of Sociology, Emeritus, at Princeton University spoke about the New Jersey Families Study, “How do families build skills in their pre-school children and help them get ready to learn?” With the use of an “innovative video ethnography” in homes, the study is able to witness interactions between parents and children and collect valuable data particularly linked to cognitive and social-emotional development. 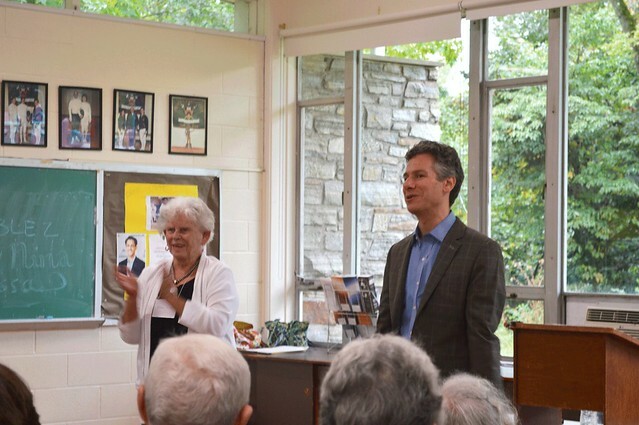 David Mulford, who has had a life long interest in the American presidency, presented an entertaining and well researched talk on the life of Jimmy Carter. Rev. Dr. David Mulford has degrees from Colgate University, Princeton Theological Seminary and Drew University. He has taught adult educations classes, Elderhostel classes and college classes, and has spoken to church groups and civic clubs and retiremrnt communities. His presentation, “JIMMY CARTER, PEANUT FARMER TO PRESIDENT” explored the early life, the rise to power, the presidency and the amazing long and productive retirement of our 39th president. A man of deep faith who shunned the “high life” both during and after his years in the White House. His is a life and a presidency worth reviewing. 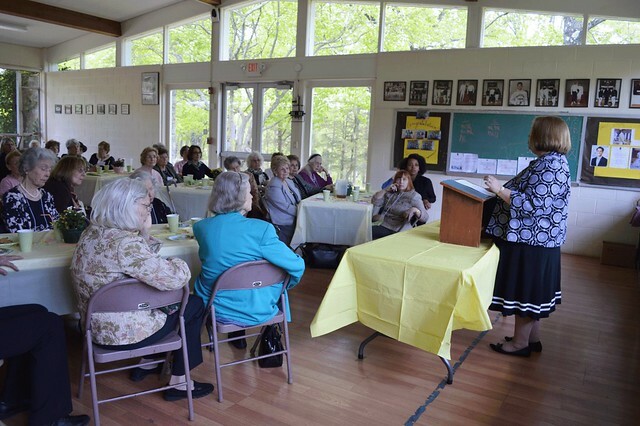 The November program of the Princeton Women’s College Club featured an interesting and important presentation tracing the legacy of slavery in the Sourland Mountains dating back to the Revolutionary War. It was given by Beverly Mills, Elaine Buck, and John Buck. Elaine Buck and Beverly Mills have researched and written a book “If These Stones Could Talk” which vocalizes not just the hardships and stark realities so many blacks faced as slaves and then “apprentices”, but also to underline the thriving communities and economic contributions of their ancestors. Their research and the hours they spent with local elders led to the preservation of the Stoutsburg Cemetery and formation of the Stoutsburg African-American Museum. John Buck, is the current President of the Stoutsburg Cemetery Association and President of the Sourland African American Museum located in Skillman, NJ. Mr. Buck is a lifelong resident of Hopewell Borough. He is retired from Princeton University Civil Engineering Department; he is also a member of Heavy and General Labor’s Local 172. He is proud to serve as President to such a distinguished group of African Americans who rose from slavery to being men and women of valor and are now lying in their final resting place at Stoutsburg. This fascinating collection of stories, song, and visual features should captivate our interest and imagination. As always, guests are welcome. —Barbara Johnson. Photos from meeting; courtesy of Nora Ananos). News clipping: New Home-museum-Stoutsburg Sourland: Mount Zion AME Church, will be future home of the Stoutsburg Sourland African American Museum. May 21 2018 (1:00 p.m. at Windrows-Nassau Room) (12 noon-1 pm for members and their guests Annual Lunch and Board Members Annual Election–lunch menu). Speaker: Dr. Karen Fanta Zumbrunn presents: TRIBUTE TO WOMEN COMPOSERS AND LYRICISTS OF THE POPULAR SONG: The Great American Songbook is a term that generally refers to those melodies and lyrics from the 20s through the 60s–pop tunes, stag musicals, movies which have been handed down from generation to generation and have stood the test of time. It is a little known fact that many of our enduring music classics of Tin Pan Alley were written by WOMEN. Dr. Karen Zumbrunn presented the background on some of the amazing women who broke into what was very much a man’s world. Selections will include “Fine and Dandy”, “Don’t Blame Me”, “Just in Time”, and many others. 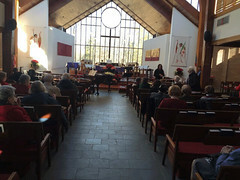 This entertaining and informative program included Dr. Z at the piano and voice, and the audience participated as well. Dr. Zumbrunn has degrees from Ohio State (B.A and M.A) Harvard (Ed.M) and a PhD from The University of California at Berkeley. She studied at the Sorbonne and L’Ecole Normale de Musique in Paris where she performed at the “Blue Note” in Paris and recorded with the International Stars of Jazz in Rome. Dr. Zumbrunn performs widely in the area. Speaker invited by Barbara Johnson. CLICK HERE to see photos of event. CLICK HERE to see information and photos. February 19, 2018 David Mulford: HARRY TRUMAN, THE MAN FROM INDEPENDENCE. Our speaker, David Mulford, has had a life-long interest in the American Presidents and their families. His talk reflected on the life of a Missouri farm boy, without a college education, who overcame early failures to become one of the most popular presidents in the history of our country. The Reverend Dr. Mulford is a retired Presbyterian minister who has served churches in New York, New Jersey and Florida. He earned degrees from Colgate University and the Princeton Theological Seminary and has taught adult education classes and Elder Hostels and speaks frequently to retirement communities, church groups and to the Women’s College Club. Organized by Barbara Johnson. Our October program featured Helen Goddard, the wife of a Professor at the Institute of Advanced Study, and an educator in her own right. Mrs. Goddard’s main interest is geography and her description of her talk was very enticing. Mrs. Goddard graduated with a degree in Geology from Cambridge University. She has taught in several schools including a state school for children age 11 to 18, The International School in Geneva, Switzerland, and a 6th form College in Cambridge, England. Since coming to America in 2004 she has taught a geography course at the Evergreen Forum and has spoken at various local places including Community Without Walls, the Friends of the Institute for Advanced Study, The Nassau Club, The Present Day Club, the Stuart Day School and Stonebridge and Windrows. Apart from geography Mrs. Goddard likes to dabble in gardening and cooking, and she runs an English Conversation group for visitors to the Institute for Advanced Study every Monday. Speaking with her while arranging this program has been extremely enjoyable and enlightening. September 18, 2017. A Princeton Institution Well Known Internationally–Speaker Jon Lambert, a local Entrepreneur Who Made Good! For quite a few years, we have enjoyed learning about local businesses that belong to our community. One of our members suggested this year’s speaker, a boy who attended Princeton High School with her son. His story is a good illustration of how he turned a store specializing in a product that would have been expected to become obsolete by changes in modern technology to evolve into a successful institution. Jon told us about the history of The Record Exchange, which began in the early 70’s when the founder drove a van around the North East, then found a small location on Nassau St., and finally moved to its present location on Tulane St. He discussed how the store survived the digital revolution of 2000, a time when all major record stores closed within the next ten years, how many visitors to Princeton come just to shop in The Record Exchange, how they attract and continue to see a large roster of dealers who come from all over the world to buy records and resell them in their homeland. He will discuss how he and his staff acquire merchandise and how they encourage customers to sell their unwanted product to them. It is the used merchandise that makes the Record Exchange popular, the concept of “exchange”, shifting configurations of music and movies, cassettes to CDs, VHS to DVD and Blu-Rays, but always vinyl. The store creates a welcoming environment to encourage “physical” shoppers, and they join social media to engage younger customers and to maintain relationships with their customer base. Jon will be accompanied by Ben Chatrer, an employee who has been working at PREX for about 30 years and is the main record appraiser. Jon’s early years were spent in Hopewell; his teen years in Princeton, and presently in Rocky Hill with his wife, a local librarian, and two fat cats. Jon has a passion for books, and of course, music. January 16, 2017 All club members were invited to come to a morning continental breakfast at the Nassau Club at 10:00 a.m. This winter gathering was a great chance for us to get to know one another better and to bring a friend who might be interested in joining the club. Event hosted by Kathy Hutchins. Jocelyn and Tom Colao presented us with holiday songs. They offered classical, musical theater, and in Jocelyn’s words, one “jazzy” selection. In Tom’s words, concluded their program with a “HEAD BANGING ORGAN SELECTION.” Click here for more photos taken by Kathy Hutchins. 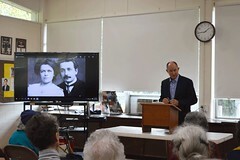 October 17, 2016 “All Things Albert Einstein” presenter Tim Fagin, Princeton Tour Company. September 21, 2015. Eve Mandel, Director of Programs and Visitor Services of the Princeton Historical Society. “Princeton: Then and Now” Photos taken by Patty O’Connell. The August 19, 2015 issue of The Princeton Sun (www.theprincetonsun.com) has an informative article about our September General Meeting. CLICK HERE to see the article by Vita Duva. October 19, 2015. “Princeton: Yesterday and Today. Are we ready for the next Princeton?” J. Robert Hillier (Bob) will stimulate our thinking as he covers the last seventy years of architectural perspectives in Princeton. Moving from today to tomorrow, he will discuss what is happening to real estate and the resultant architecture in our area. Always engaging and entertaining, Bob’s talk will alert us to our changing community. His architecture firm, Studio Hillier, was founded in 2011 with the belief that “architecture performs as both an index and path for advancing society and human history.” It is internationally recognized and its architects have received many awards. Bob is well known to us as he funds a scholarship in honor of our longtime member, his mother, Florence Hillier. Robert Landau, grandson of the founder, Henry Landau, told us how the store evolved over 100 years, discussed some of the celebrities who have shopped there, mentioned how he and his brother Henry interacted with their suppliers and crafts people in the USA as well as world-wide, and the “Einstein Corner”. December 7, 2015: Alanna Drzyga of Monday Morning Flowers demonstrated how to design seasonal styles arrangements for the holidays. January 18, 2016: No General Meeting. Gathering at the Nassau Club at 10:00 a.m. for coffee and goodies to begin the new year and catch up with all the planning for our 100th birthday celebration on Sunday, April 10, 2016 at the Chauncey Center at 3:00 p.m.
Woodrow Wilson, much of whose life was centered in Princeton, was President of the United States when one hundred years ago the WOMEN”S COLLEGE CLUB of PRINCETON was organized. In fact, in 1916 Wilson was elected to his second term as president. In this talk, our speaker and friend, The Reverend Dr. David Mulford, takes a look at the often tumultuous life of our 28th president, from his birth in a Presbyterian Manse in Staunton, Virginia in 1856 to his death in Washington, DC in 1924. Photos taken by Nora Ananos. After working as a dance critic, a business journalist, and a blogger, Barbara Figge Fox inherited her grandmother’s button collection. Now, as a button evangelist, she told entertaining and compelling stories about vintage, antique and modern buttons. Barbara is a vice president of the New Jersey State Button Society which celebrates National Button Week, March 15 to 21, and invited audience to attend the New Jersey State Button Society show in Titusville, New Jersey, on May 7. April 10, 2016 Our 100th birthday celebration , at the Chauncey Center on Sunday at 3:00 p.m. CLICK HERE for more photos. November 17, 2014. Jon Hauge, of Savory Spice Shop, on spices, history and other uses of them. December 8, 2014. Stuart Country Day School “TartanTones” was the special feature. January 19, 2015. Nassau Club social coffee. April 27, 2015 Bridge Benefit Luncheon and General Meeting. This is the club’s one fundraiser for 2014- 2015 on Monday at the Present Day Club. 11:30 a.m. – 2:30 p.m. Bridge and board games were features of the occasion. Co-chairs Carol Stawski and Aloha Holloway. February 17, 2014. Reverend Dr. David Mulford on “Four Near-Great Presidents and What Made Them So”. 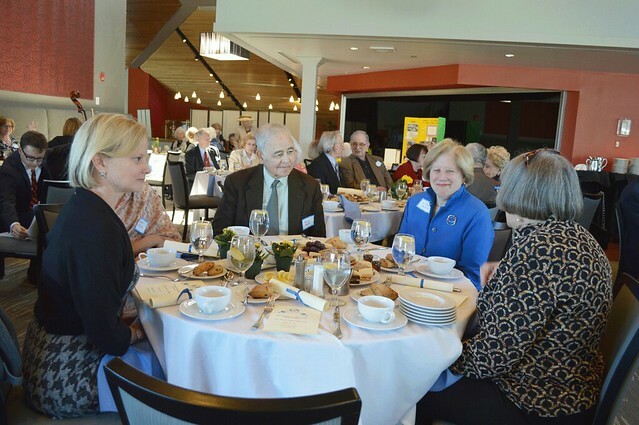 April 28, 2014 – April Bridge Benefit Luncheon Annual Fundraiser at Present Day Club, starting at 11:30 a.m.
May 19 – Annual Business Luncheon, with Jane Peter Estes speaking on “Women in the Victorian Age.”, starting at 12 noon. September 17, 2012. Princeton University Professor of Sociology Thomas Espenshade. October 15, 2012. Rev. David E. Mulford on U.S. Presidents. November 19, 2012. Larry Friend, the flag man, from Annandale, NJ. December 10, 2012. American Boy Choir. February 18, 2103. Mr. Alan Mallach on Italian Opera. March 18, 2013. Ms. Gwendolyn Jones, Founder of The Garden State Storytellers’ League, Inc.
April 22, 2013. April Fundraiser at the Present Day Club. May 20, 2013. Annual Business Luncheon Meeting, 12:00 pm – Elections – Speaker: Mr. J. Robert Hillier.